In Gender, Power, and Persuasion, Mignon Jacobs examines the ancient Genesis narratives with fresh insight and clarity. She weaves together both a faithful identification of key texts and a modern "multicritical" analysis of those texts. Indeed, this book is particularly relevant for egalitarians looking for different methodologies to address the gender issues of the familiar Genesis stories. Thus, while her foundations are evangelical, Jacobs is not afraid to probe the Old Testament from many new perspectives: psychological, feminist, postcolonial, literary, form, and ideological criticism. 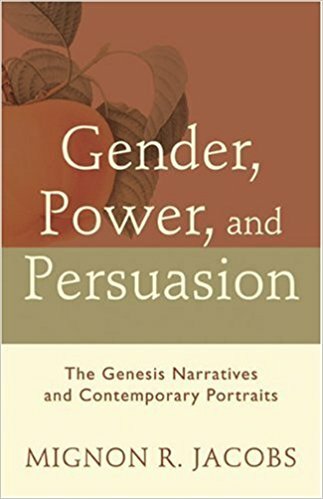 Most crucially, as the title suggests, Jacobs explores the Genesis narratives from "the conceptual framework of gender as it is manifested in power and persuasion" (208). The book is divided into three main sections. In part 1, Jacobs discusses the nature of divine and human dynamics in Genesis 2–3, the stories of creation and the fall. She underscores the tension between human power and the power of God. She observes the relative powerlessness that all humans experience in a system in which the divine will dominates, yet she also emphasizes the significance of Adam and Eve's choices as empowering them within this system. In part 2, Jacobs approaches different configurations of gender dynamics as they appear in various stories: male/female—Abraham and Sarah (Gen. 12, 20), Judah and Tamar (Gen. 38); male/male—Isaac and Jacob (Gen. 27–28); female/female—Sarah and Hagar (Gen. 16, 21), Leah and Rachel (Gen. 29–30). She pays special attention to the nature of perceived status, public and private roles, deception and disguise, and levels of argumentation. In parts 1 and 2, each chapter concludes with relevant observations about the Genesis narratives, but in part 3, Jacobs applies these observations to contemporary contexts. In particular, she looks at how the Old Testament relationships might typify the problems and/or solutions that arise in relationships in the workplace and home. She analyzes the role of power in both the public and private domains as well as the role of persuasion as part of the modern communication process. Jacobs approaches the dysfunctional relationships of Genesis with a keen eye for observation; she seamlessly changes roles from biblical exegete to family therapist to political analyst. For example, it is almost as if she is in a counseling session with Abraham asking him to be honest about his request to Sarah that she pretend to be his sister before the Pharaoh: "What appears as an effort to persuade Sarah is merely a way to inform her of a decision that he has already made concerning her" (77). Indeed, as Jacobs points out, the Pharaoh in his Egyptian court is actually the more courteous and hospitable male in this story. Even as Jacobs brings the narrator, the characters, and the ideological framework under serious scrutiny, simultaneously she is discovering new insights about the text itself. Thus, she notices that Sarah's relationship to Abraham is limited to patriarchal models of childbearing. Yet, she also notices that "being female does not deter Sarah from oppressing another woman [Hagar] . . . or from attempting to limit someone else's power" (152). Though Jacobs usually keeps psychological/political analysis in healthy balance with the biblical text, sometimes she seems to force the text into her gender-power framework. For example, while she is right to criticize Abraham's dishonesty with Sarah concerning her role with the Pharaoh, she assumes too much by suggesting that Abraham was primarily concerned with selling Sarah for a bride price: "It is not that he disbelieved that Sarah would be taken as another's wife, but that he believed and deceived in order to ensure that she is taken as another man's wife" (82). In this way, Jacobs moves into the realm of uncertain speculation. In a similar scenario, Jacobs seems to compel the text to fit her persuasion framework. Thus, she suggests that Jacob did not really deceive his father Isaac, but rather Isaac, more sharp-witted than he appeared, deceived Jacob and knowingly gave his blessing to him. Here Jacobs's understanding of the role of deceit in persuasion takes precedence over the plain narrative arc of the Jacob story. Nevertheless, Jacobs's overall treatment of the text is analytically precise and fair to the narrative context. In Gender, Power, and Persuasion, Mignon Jacobs displays the rare ability to write about "the richness of the biblical tradition" and "to investigate, resignify, and value the role of biblical narratives in modern life." Her readings of the text are full of multicritical insight and follow a sound methodology that offers fresh perspective on the complex issues of gender within the Genesis narratives. Jordan Easley is an MDiv student at Gordon-Conwell Theological Seminary. He has also published in Modern Reformation.